Raises the toilet seat height by 2" or 4"
Maddak Extra Wide Tall-Ette Elevated Toilet Seat - 4"
The NEW Easy to install - Flip-Up Toilet Riser by features a unique hinged design, which allows the riser seat to flip up and out of the way when not in use. The heavy-duty molded plastic is durable and can hold up to 250 pounds. 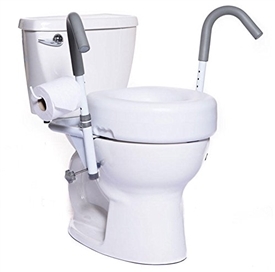 The Flip-Up Toilet Riser adds 3.5” in height to your toilet, allowing for ease in getting on and off the seat. The Flip-Up Toilet Riser is lightweight and can be easily attached to the bowl, allowing you to transfer it between toilets with ease if needed. The toilet riser comes in both standard and elongated bowl sizes, accommodating your toileting needs. The Raised Toilet Seats add height to a toilet seat; they are designed for individuals that particularly have difficulty sitting down and/or getting up from the toilet. 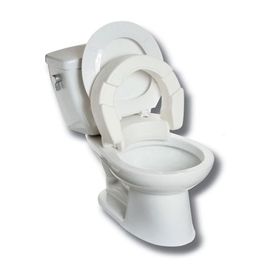 All Raised Toilet Seats have a heavy-duty molded plastic construction with the arm sleeves and receivers being made of metal. They allow the individual to still use the existing toilet seat and lid, are lightweight and portable, and easy to clean.